Journalists, in the BBC and elsewhere, have come to accept that where a big story is breaking, John Simpson will probably be there first. In the competitive world of foreign affairs reporting, a nose for the right place at the right time is invaluable. John Simpson's remarkable gut instincts have drawn him into the thick of the action time and time again, and earned him scoops which are the envy of his colleagues. His most recent, and most demanding, major foreign assignment saw him smuggled into Afghanistan as the Taleban fell, disguised as a woman. He raised a few eyebrows, however, as he strode into Kabul through a cheering throng, declaring: "It was only BBC people who liberated this city. We got in ahead of Northern Alliance troops." The BBC said later that "John was being ironic". John spent a rather lonely childhood, brought up by his father in London and Suffolk after his parents separated. He found his feet at Cambridge, where he edited Granta magazine. He joined the BBC at 25, as a sub-editor in the Radio Newsroom, before becoming a political reporter. He attracted publicity early, when the then Prime Minister Harold Wilson apparently punched him in the stomach when John asked him whether he was about to call an election. He was appointed political editor before the 1970s were out, but found his natural calling as foreign affairs correspondent, One of his first assignments was in Angola, covering the vicious fighting there in the 1970s - an experience he describes as the most terrifying of his career. In 1991, he was the BBC's key correspondent in Baghdad during the Gulf War, staying in the city despite being ordered to leave by his employers. Since he became the editor of the BBC's World Affairs Unit, the stories he has covered chart the major upheavals in world history. He was in Romania as Ceaucescu fell, and in South Africa as Nelson Mandela was released. 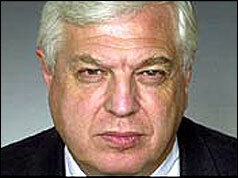 He has witnessed 30 years of upheaval in all corners of the globe, but John Simpson has no thoughts of retiring. "It's a way of life," he says. That night, I was just getting all my reports ready when suddenly there was an announcement that Ceaucescu and his wife had been executed. Feverishly I wrote a new, different script, changed it all around, just managed to put it out, and threw the pen down on the table with a sense of relief - I had about 15 seconds to spare. I looked down at the pen and it was the one that Ceaucescu's housekeeper, who'd taken an inconceivable liking to me, had handed to me from Ceaucescu's desk earlier that afternoon... So I'd written Ceaucescu's obituary with his own fountain pen.